My Halloween table. 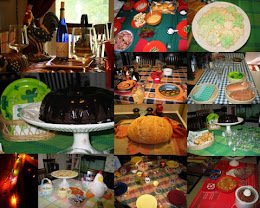 I love Halloween stuff...dishes, napkins, table linens, candles. We made fajitas on the grill one last time last week. It's one of our favorite meals. The butcher talked us into trying boneless sirloin instead of flank steak. It was delicious. We did a lot of grilling on October...and one last time yesterday. We cook with charcoal and it's hard to keep the temperature high enough when it gets cold outside. I love standing on the patio in the leaves while Regis cooks. Tomorrow, the grill will be covered for the winter and the patio furniture stored in the garage. We'll miss it.